From the Paper of George T. Morgan's Sketchbook into 99.9% Pure Gold! Some of the best, most creative ideas stay within the pages of notebooks -- drawings of graphite and ink that never see any realization beyond the page. And, if it weren't for some intrepid searching, the beautiful and detailed sketchbook conceptions of George T. Morgan would have remained locked away in the inner vaults of the Smithsonian Institution. 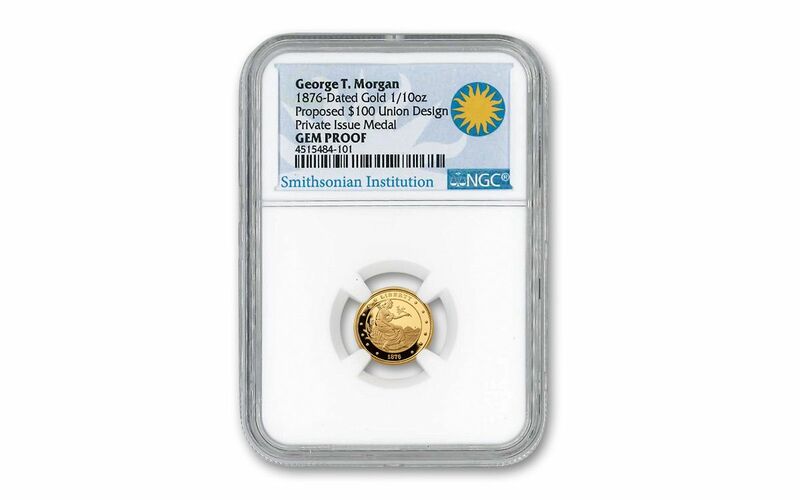 Fortunately in 2004, designs for what would have been an 1876 Gold Union were uncovered, and in 2005, authorization was granted by the Smithsonian to privately mint proofs that carefully recreate Morgan's original vision. 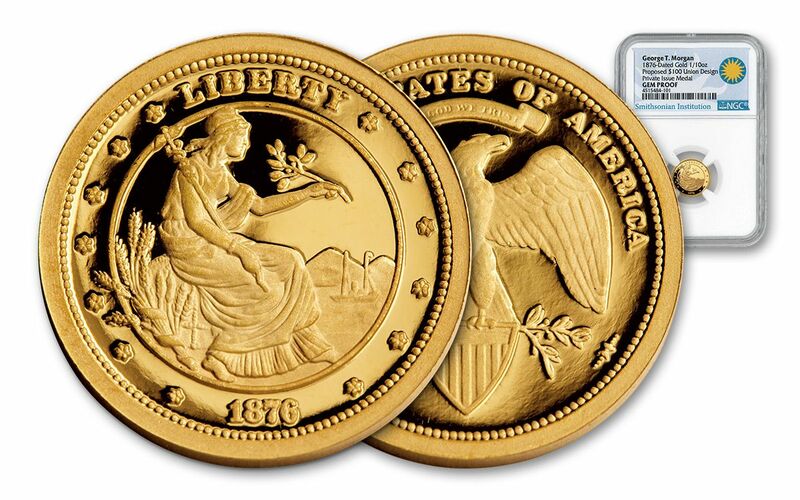 Now, GovMint.com is proud to present the 2016-minted 1876 1/10-oz Gold Union Proof. Privately struck and licensed by the Smithsonian Institution, each proof is minted in one-tenth ounce of 99.9% pure gold. You'll see the iconic Lady Liberty, sitting on a shipping bale with olive branch in her left hand and the intertwined snakes and wings of a caduceus over her right shoulder. Liberty overlooks a landscape of mountains, ocean and ship while surrounded by stalks of wheat. 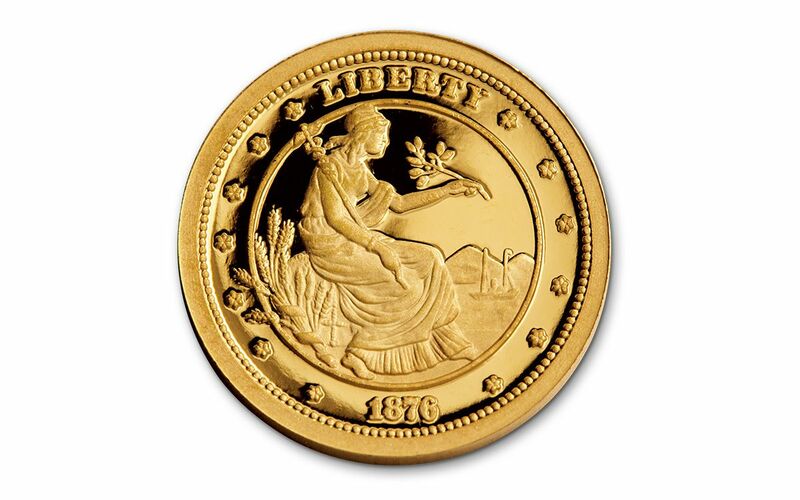 Finally, Liberty is wreathed by 13 stars representing the original colonies and the date of 1876 -- just as it appeared in Morgan's original drawing. 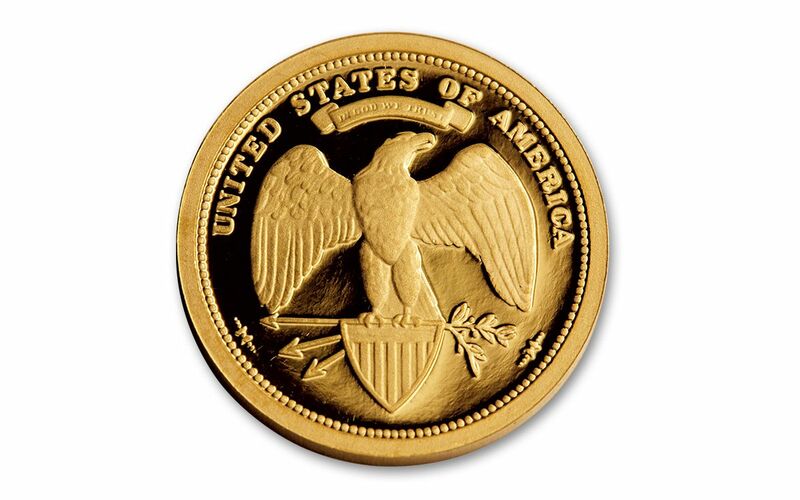 The reverse is just as majestic, featuring an eagle similar to the one on the Morgan Silver Dollar, surrounded by the inscriptions of "United States of America" and "In God We Trust." Your proof will exhibit radiant mirrored fields and beautiful frosted images with sharply defined detail -- so much so that each of these proofs has been graded Ultra-Cameo Gem condition by Numismatic Guaranty Corporation (NGC). Your proof will also come in a sonically sealed acrylic case, preserving its highly-graded condition for generations to come, along with special Smithsonian packaging. Finally, your proof will come with a special certificate of authenticity. GovMint.com is the only place you can buy this exclusive proof. And, with a limited mintage of 500 and high collector demand, we're anticipating that the window to claim this for your own will be very short. Take this opportunity now to make this found treasure part of your collection while you still can!